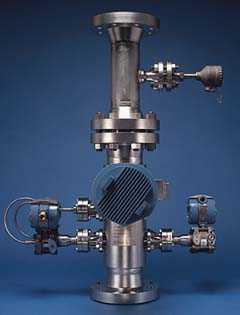 The Daniel "MEGRA" Multiphase Flow Meter - developed from original Shell research - is a unique flow metering device capable of measuring the individual flow-rates of oil, gas and water in a three-phase fluid flow. The meter is based on the principle of fraction measurement by the Multiple Energy Gamma Ray Absorption technique, ("MEGRA"), and provides a high accuracy, on-line measurement including mixture and individual component flow-rates, totals, water-cut, gas volume fraction, mixture density and process temperature and pressure. The fraction measurement and computation is also automatically compensated for variations in the produced-water salinity, leading to enhanced measurement performance and greatly reduced calibration frequency under these conditions. Daniel Industries, P.O. Box 19097, Houston, TX 77224-9097. Tel: 713-467-6000; Fax: 713-827-3880.